As of writing this there are 570 unique game/variations. I started out buying a few lots on ebay to relive the dozen or so games I had as a kid. Looking back I had a pretty decent selection back then – Wonderboy III, Shinobi, Psycho Fox and even Alex Kidd in High Tech World I still play even now and again. Even now with at least one copy of (almost) every game released for the system, the games I had back then are still the ones that get played the most today. Includes European ‘Classics’ and ‘Kixx’ variations, Korean releases, Japanese releases, Card games (from all over the world), Tec Toy releases (Brazil) and Portuguese Purple releases. Also the peripherals – A Japanese system, 3D glasses and Light Phaser, all new in box. There’s also the strange one-off stuff here – Prototypes, Kiosk carts and Demo carts. The top half is all US releases – I’m about a dozen games short of a full set here. 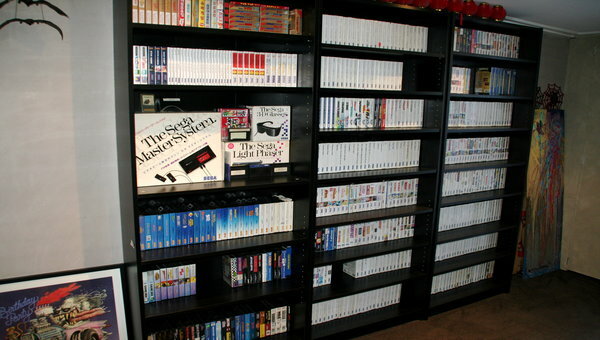 The bottom half is all European stuff – especially games that didn’t get a releases either in Australia or the US.